Exploring symmetry encourages children to better understanding their individual bodies, their bodies in relation to others, and how their bodies exist within a group of people. I love playing with symmetry with wee babes just beginning to be curious about "same" and "different" as well as high schoolers and adults who can explore complex shape, structure, and relationship while playing with form. The most basic symmetry exploration includes asking a child to make a shape that is the same on both sides. It helps to demonstrate a few simple shapes for very young children, emphasizing how the arms and legs look the same on both sides. You can encourage kids to think about their hands, feet, elbows, faces, hips, and spines. Encourage kids to make shapes that are different on both sides, again offering your own examples to help the youngest students best understand. You can also sculpt children into symmetrical and asymmetrical shapes to provide examples and then encourage kids to sculpt each other. These shapes can be done standing, on the ground, sitting, or against a wall. Encourage kids to share their shapes with each other, with the group, or with you as a parent/teacher. You can introduce symmetry with a partner simply by standing face to face with a child and trying to mirror each other with similar shapes. Again, take time to explore asymmetrical shapes as well. Once you are both comfortable, try connecting or flattening your shapes and imagining a line splitting your couple shape into two, showing us the symmetry. Play with "folding" your shapes together or creating different, more surprising lines of symmetry. One particularly fun group structure that I enjoy using with my students is creating symmetrical and asymmetrical tableaus. One person begins by making any shape they choose in the space. 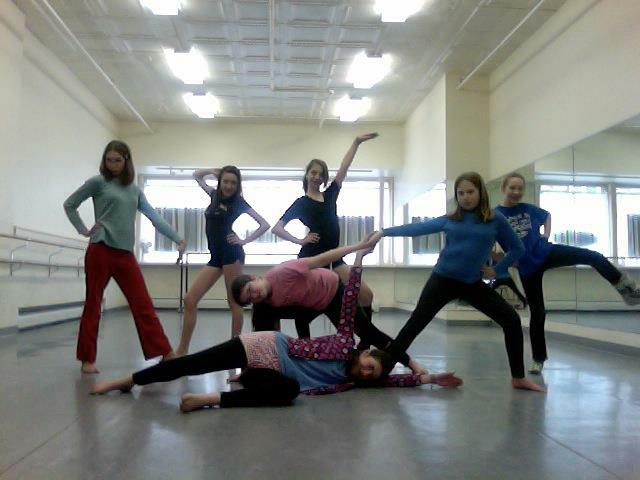 The second person must join the tableau by creating a shape that makes the tableau symmetrical. The third person joins, freely choosing a shape, while the fourth works to make the tableau symmetrical again. This can also be done as a tableau where everyone's individual shape is symmetrical or asymmetrical. Encourage kids to notice what shapes they are drawn to and if they feel more comfortable or curious about symmetrical or asymmetrical shapes. There are many ways to play with these simple exercises and to apply them to math studies involving symmetry. Encourage kids to play with flipping or rotating their shapes. Play with other transformations such as scaling their shapes (same shape, different sizes). Symmetrical and asymmetrical shapes can be incorporated into simple choreography studies or full dances exploring the theme.